KAWASAKI Motors Australia and Surf Life Saving Australia have teamed up to provide a MULE PRO-DXT EPS to Seaford SLSC’s vehicle fleet. The six-seater MULE PRO, prepared by Wonthaggi Motorcycles and Power Equipment, replaces Seaford’s Kawasaki MULE 4010 Diesel which became a highly reliable daily workhorse over the past four years. Justin Taylor, spokesperson for Seaford Surf Life Saving Club couldn’t be happier with the recent acquisition. “The primary reason we chose the Kawasaki MULE over the competition was that we wanted a proven, reliable and dependable workhorse,” Taylor said. “The large tray area and the functionally of the convertible rear seat/tray area is very handy for what we do. Matt O’Donnell, Spokesperson for Wonthaggi Motorcycles and Power Equipment said, “we are a one stop shop for all Victorian Surf life Saving Clubs and we can tailor each Kawasaki to meet specific club needs. Kawasaki utility vehicles and jet skis have long been the preferred choice for Australian Surf Life Saving clubs and in recent times Kawasaki’s range has been accredited by SAI Global as meeting operation standards and performance suitability in the Surf Life Saving environment. 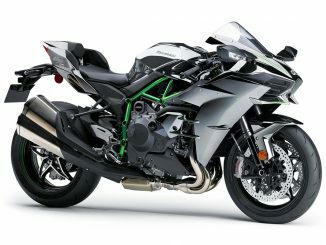 Is Kawasaki’s 1400GTR being blown away?